There is so much more to farming than you’d ever think. I’ve been here for eleven years and I’m still amazed. 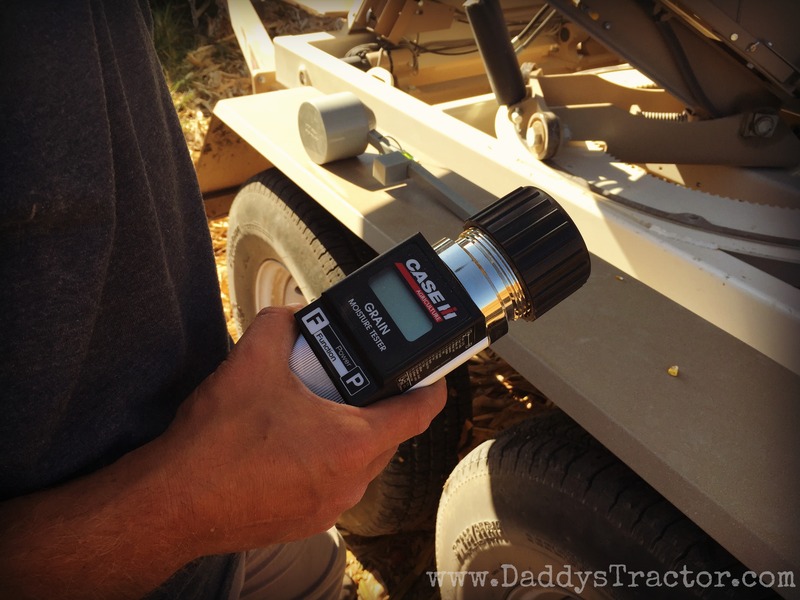 Last week I had a great time visiting a neighbor’s farm to see how they calibrate their combine monitor for accurate harvest data– and believe me, this is not your Grandpa’s combine! 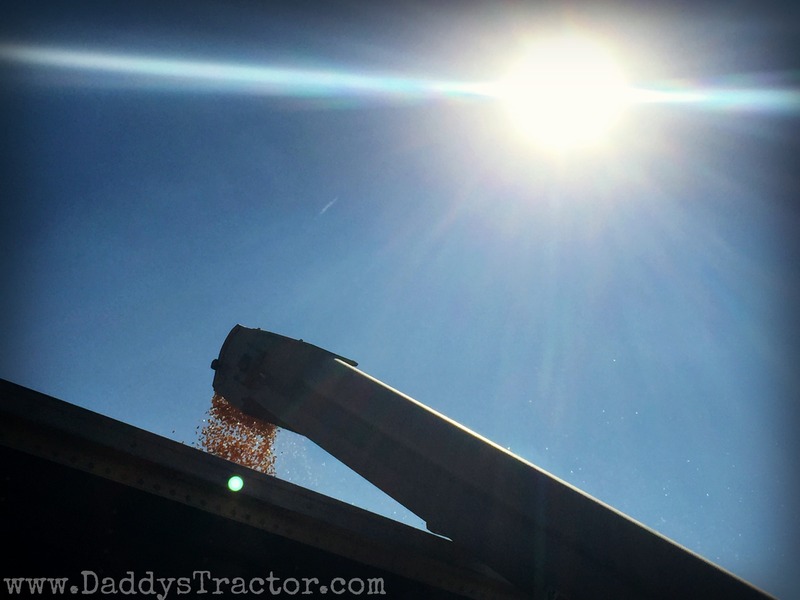 A combine’s monitor senses the grain coming in and records how much is being harvested. This lets you know right then how well the field did. 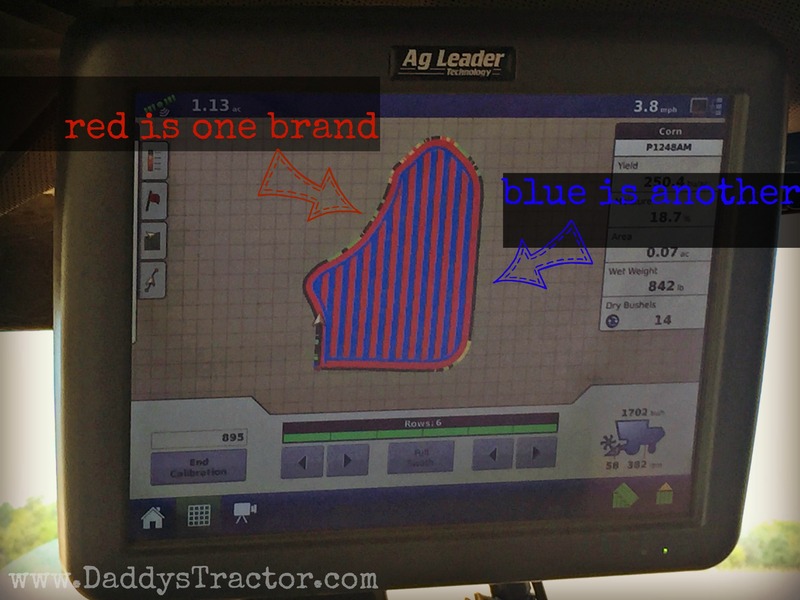 On Bray Farms, Brad used this field to test two different brands of seed, filling half his planter with each type. Now as he harvests he can see exactly how well each brand did. That is, he can see exactly if his monitor is working correctly. To calibrate the combine’s monitor Brad first harvests a small sample of corn. and then unloads the corn into a weigh wagon equiped with scales. This wagon belongs to Cory Robinson of CR Seeds & Services. He’ll be busy this fall taking it to many farm fields to calibrate monitors and checking to see if the seed he sold is working well for his customers. Now the wagon weighs the corn as well. And Cory will check the grain for a few other things while he’s at it. 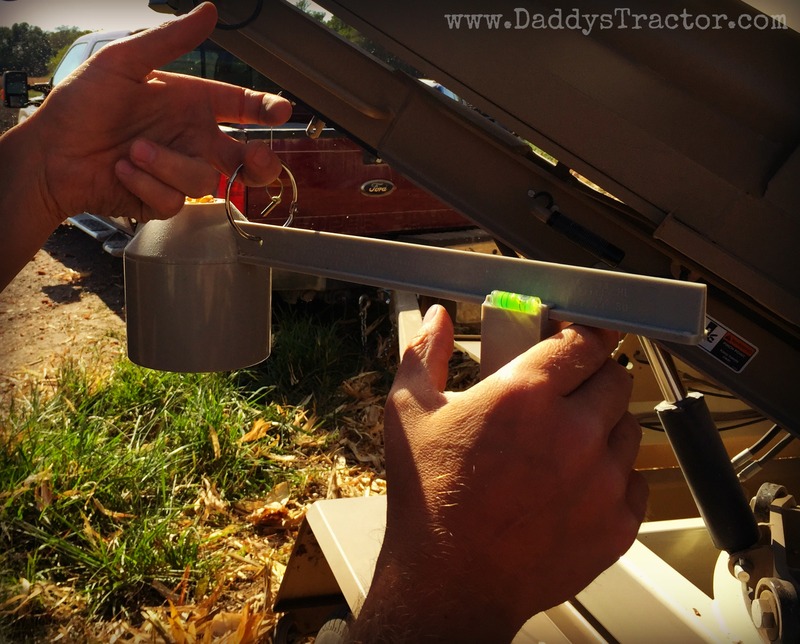 This tests the percentage of moisture in the corn. Usually the places you sell corn to want “dry” corn, about 15%. Brad’s was measuring closer to 19%, which means he’ll need to dry it before it can be sold. 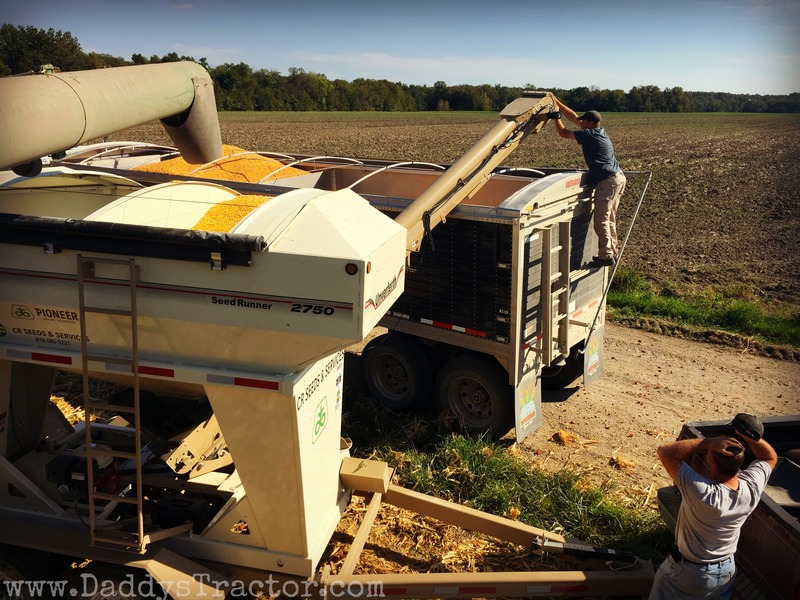 As fall progresses the corn will dry out in the field and less air drying will be necessary. 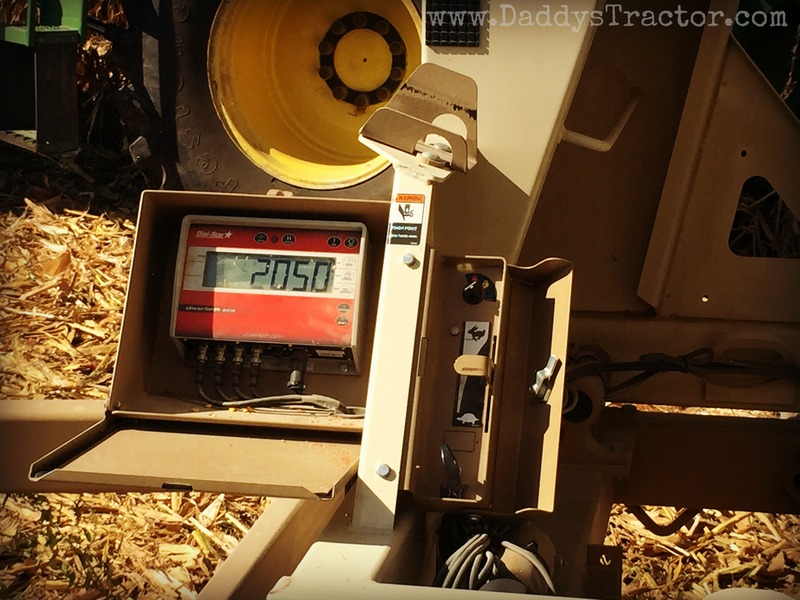 Cory also uses this little thingamajig (technical term) to find the test weight of the corn– also important when you sell the grain. 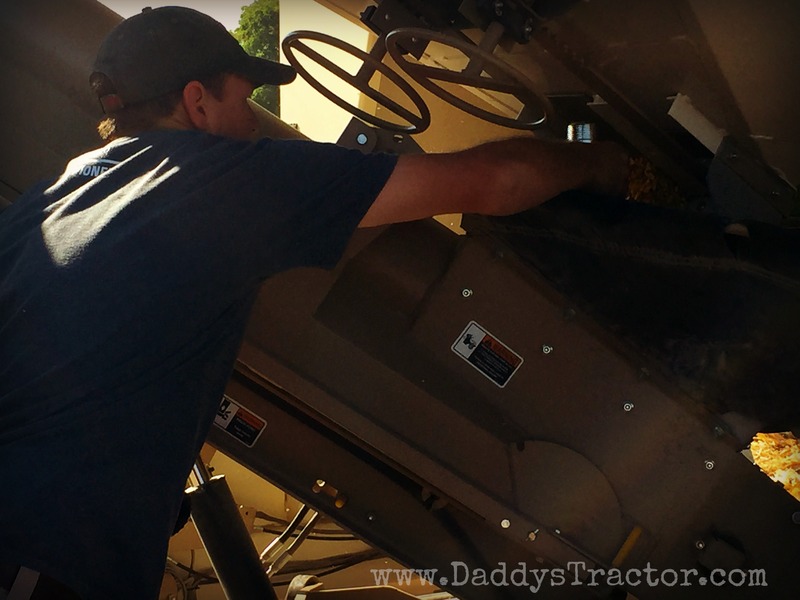 Once the tests are done Cory unloads his weigh wagon back onto Brad’s semis, which take the grain back to the dryer. 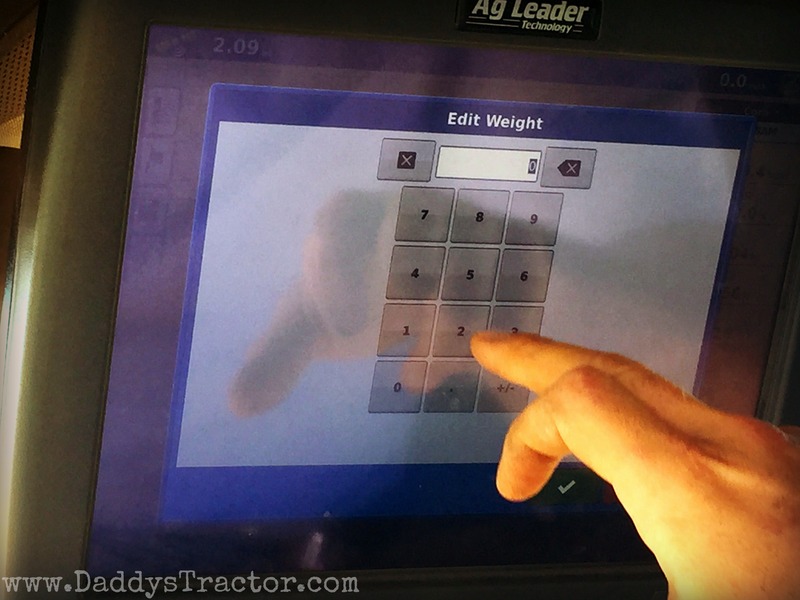 Then Cory gives Brad the numbers to put into the combine’s monitor. Look at the last line. 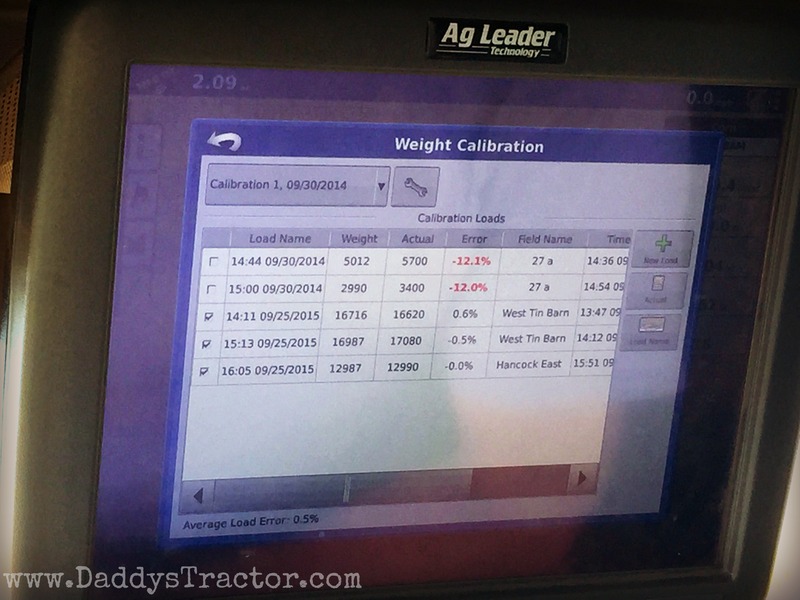 The second column tells what the combine believes the total weight of the load to be. 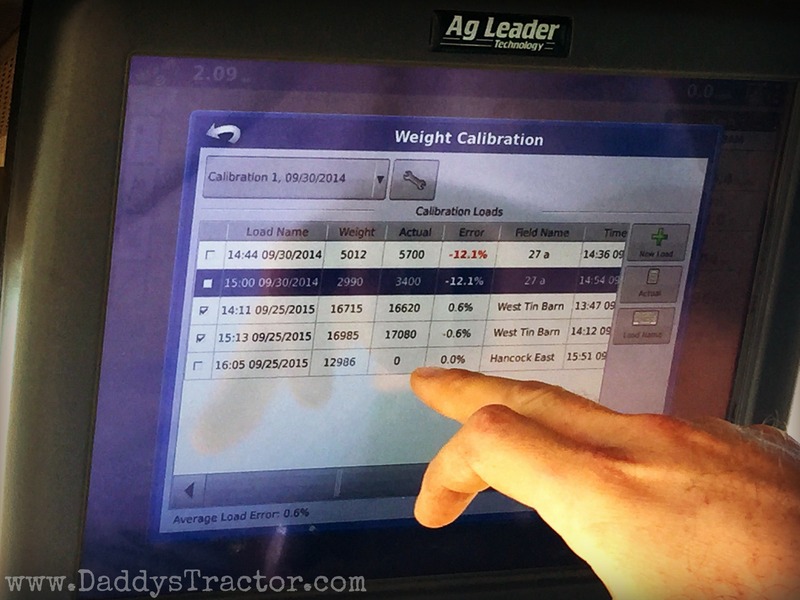 A simple click to the third column allows Brad to input the weigh wagon’s results. And the monitor will calibrate itself in just a moment to give you the most correct results. This was Brad’s third test (bottom three rows– top two are from 2014) and the total was 3 pounds off– 0.0%. 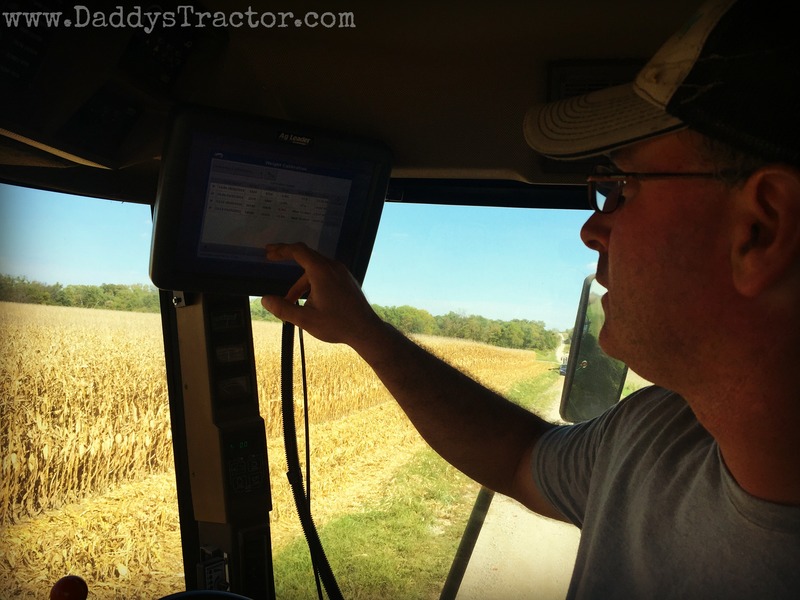 The monitor will retroactively change the data from whatever has already been harvested and Brad will have accurate maps he can use to submit to his insurance agent (insurance is based on a five year average for a field), use to plan how much grain to sell, and compare to his planting or fertilizer maps to see what seed is working well and what nutrients the crop may need. This modern world of agriculture is pretty cool. 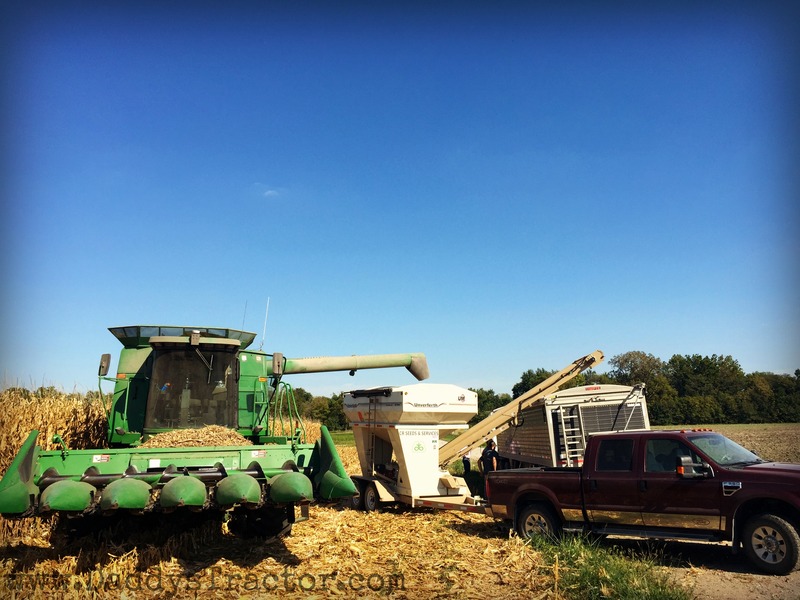 I just came across your blog while reading janiceperson.com and I am new to the ag business I really appreciate how your blog incorporates family and technology and so much research especially talking about current events like GMO’s, etc. I’m very interested in starting now a blog and have no idea where to start. I tried to find your email on your website but I must have missed it. If you could contact me at melhnyb1@gmail.com I’d love to just chat with you about your blogging experiences. Thank you so so much. 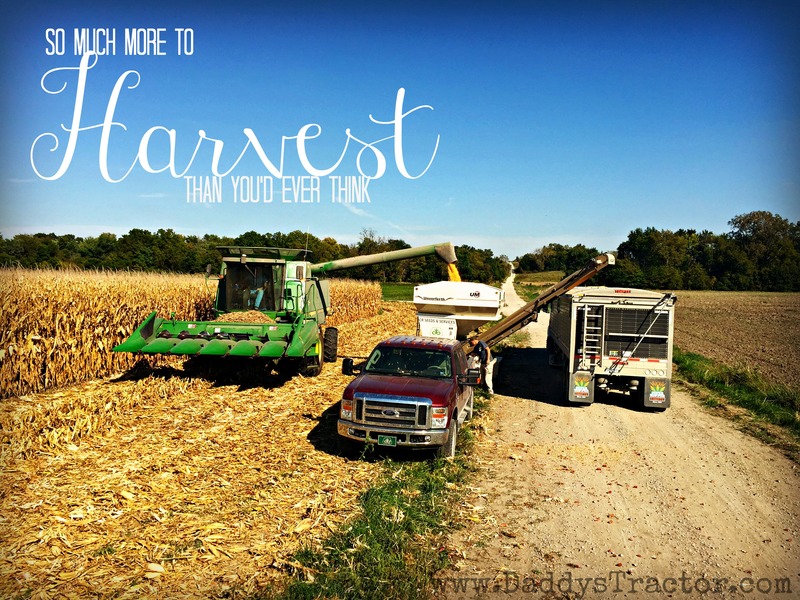 I find it fascinating to read your posts about farming and harvest. We live in a small populated area in Illinois that is surrounded by farmland, but I am a city girl. Though my grandparents and my father grew up in the country in Georgia. We have tried our hand at gardening for our family of 8 and canning/freezing and do OK, but could be better. I have a question for you. After harvest, I notice that some farmers leave the cornstalks cut off as they are, and others plow them under. Does it really matter whether or not the plowing under is done? What is the purpose for plowing under? Just some questions that I have this time of year and do not know the farmers in order to ask. Thank you. Sharon Lynn Patrick. Hi Sharon– thanks so much for stopping by! Some farmers do plow under their corn stalks while others don’t. Often the stubble is left and then soybeans are planted in the field next year. Leaving them helps prevent soil erosion. There are fields, like flat bottom ground around rivers, that do better when corn stalks are chopped. Every farmer and every field is different!